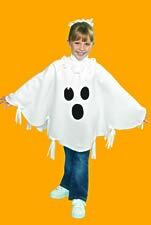 Ok, so my philosphy is you shouldn't spend more than say $5.00 dollars putting together a childs halloween costume. cheap and easy costumes is my motto. I also think you should strike a balance between making one completely from scratch and store bought. I know a lady who spent many months out of a year conceiving of each child's costume and then constructing these elaborate, very creative costumes. 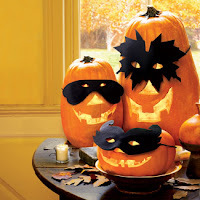 It was definately amazing, but I always wondered how much did the kids enjoy the awkward to wear costumes after trick or treating for a few houses. 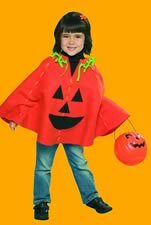 When the kids were very young, I created several little "No Sew " Costumes that could be worn over any clothing, so they could dress warm if it was cold and still have their costumes on. 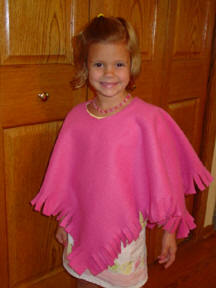 I made several little felt poncho's that could be slipped over their clothes. I made a pumpkin, a black witches/wizard poncho, and a super hero. I have long since lost the original pattern, but I found some similar ones and am posting them here. Another cute way to use hooded sweatshirt would be a cute animal, lets say an alligator. Buy a green sweat shirt. using white contact paper and markers color a little yellow oval type shape with brownish markings for the "belly" peel and stick to the front of the costume. buy googly eyes and glue to the front of the hood, above the childs forhead. Using white felt cut out teeth shaped triangles or a long zigzag that you can attach to the inside of the hood around the opening with iron on fusible webbing., for a mouth full of teeth that frames the childs head while he wears the hood. Also, every time you go to yard sales, look for clothes, jewelry, hats, boa's, etc. that can be used to build a fantastic "go to" box for when your kids are older. When they need a costume, just have them go to the dress up box to come up with their own costumes. Makes sure some basic black capes, plastic fang teeth, crowns, swords, pirate patches etc are in there. I liked to pick those types of basics up after Halloween at Walmart to add to the box. 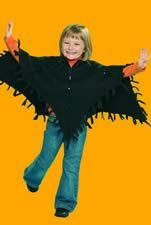 Ok, so here is the poncho idea. It can be used for so many ideas, this is just to stir your imagination!